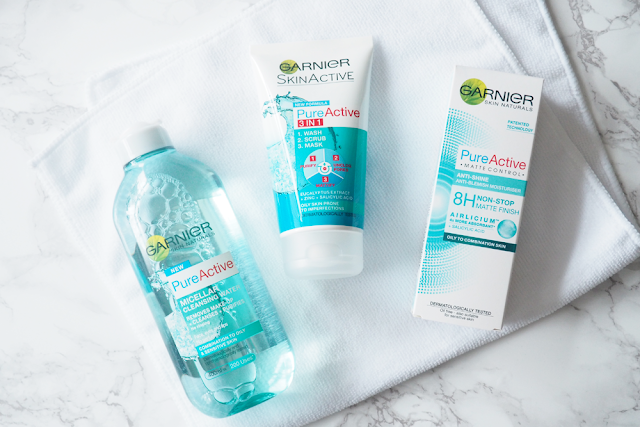 I'm getting into my skincare more these days and when the new Garnier Pure Active range launched I was beyond excited as it's designed for combination to oily prone skin. 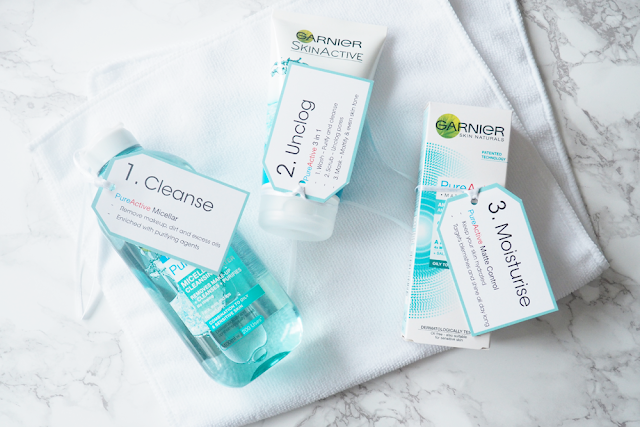 Using different products in the range to create your own long term commitment to clearer looking skin. The products were carefully formulated with ingredients such as Saliylic Acid, Zing and Eucalyptus extract to target the look of oily skin, blemishes, blocked pores and shine with a drying action. Designed for women, this range has a number of products to help you combat problem areas and help you feel more confidence in your own skin. To cleanse, I use the Pure Active Micellar Water All-In-One* (£4.99) to take off my makeup or any oil that's sitting on the top of my skin. It's an easy way to take off your makeup at night, cleanse and purify the skin, eye area and lips in one step without rinsing. Since micellar waters came out I haven't looked back. 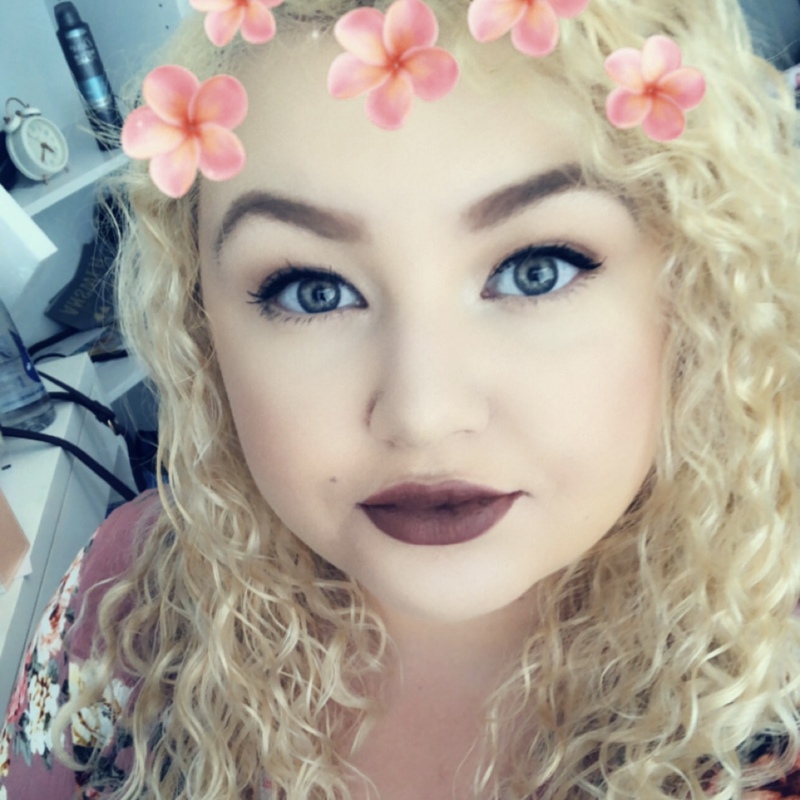 I have sensitive skin and using a foaming cleanser and having to rinse it off was my own personal nightmare as I used to be so frightened of getting anything in my eyes. I've also used the Garnier Micellar Cleansing Water before this Pure Active version came out as their micellar waters are so good to take all your makeup off quickly without having to stumble into the bathroom to wash your face after a night out. I love using these type of product especially since I always use an extra pad once I think all my makeup is off and it picks up product that the naked eye can't see on the skin. When I'm in the bath or shower, I love using the Pure Active 3-in-1 Wash, Scrub and Mask* (£3.79) to really get into every pore and clean them out. To wash the skin, you use it on wet skin to help intensely cleanse and purify the skin. It helps remove excess sebum (oily residue) and protect against the appearance of spots. To use as a scrub, you massage the product into the forehead, chin and nose to help remove dead skin cells and unclog your pores. To use it as a mask once or twice a week, you apply to dry skin and leave on for three minutes then use a wet flannel or glove to wash off. This helps to tone and mattify the skin. It's such an innovative product and since I have to exfoliate my forehead and nose every day (gently) it's really good at doing exact what it says it's going to do. Once you've completely cleansed your face, you apply the Pure Active Matte Control* (£7.35). It claims to deliver 8 hours of non-stop matte control for skin that is prone to shine or blemishes. The combination of Airlicium derived from natural ultra-absorbing mineral silice and purifying Salicylic Acid helps deliver eight hours of protection from shine whilst reducing the appearance of blemishes. This is a great product to apply before your primer as it helps to blur out pores and uneven skin texture, providing a great base for your makeup. It helps hydrate the skin at the same time as stopping your skin from producing excess oil that most moisturisers to do people with oily/combination skin. 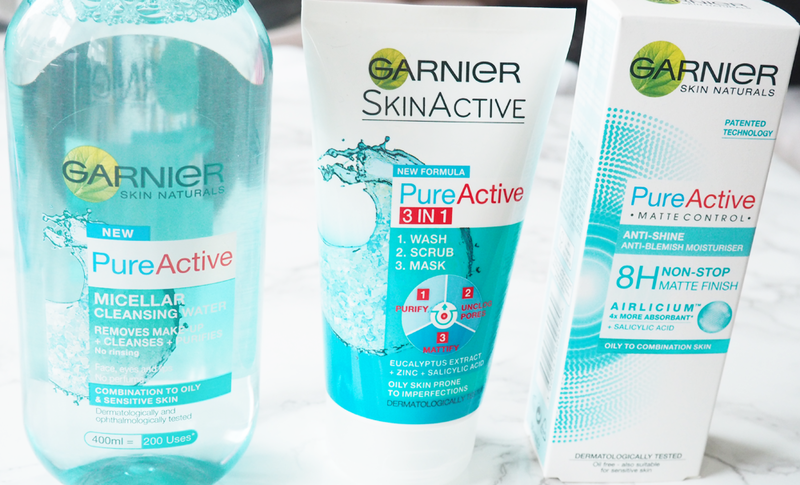 I love that the Pure Active range is so affordable and doesn't leave you with an excuse for not trying out if you have this type of skin like me. It's rare that I find products aimed for oily skin to actually be worth the money and you should really give it a go if you're looking for something new to try.